We got back from 7 days/8 nights in Quito, Ecuador where we ran three Youth Ministry workshops (see photo above) at a sort of Latin American job fair called Latina 2006. It was great to have twenty-somethings from over 17 countries show an interest in youth work. Very encouraging. 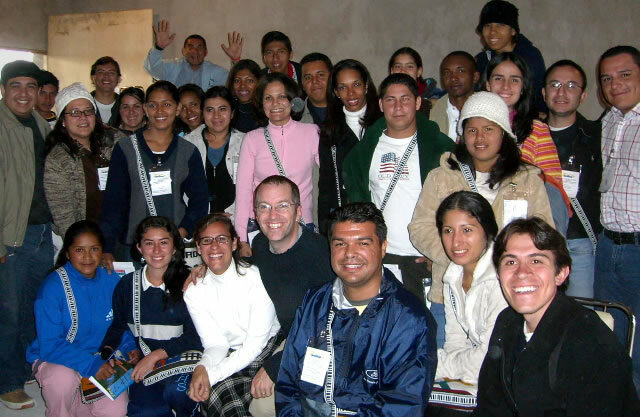 There was one group of 7 Colombian youth leaders who asked for more in-depth training. They told us there were another 23 youth leaders from their church back in Colombia who couldn't make it to the conference. It was terrific to be able to hand them a CD with the interactive, animated youth ministry course which we've been working on for the last 3.5 years. Annette took a couple hours and showed them how to use the course to train all of their leaders. They were also excited that the CD contained thousands of other resources they could use with the youth group. I m just curious what r there names?